Shiva is the transcendental state; it means one who brings only benevolence and good to the world. So when Kali, an enormous, destructive power was in rage; in that moment, Shiva came and lay down. As soon as she stepped on him, Kali’s power got controlled, channelized and became benevolent. So, even if there is destruction, it should be benevolent. See, when you want to bring down old buildings, what do you do? You put dynamite under the building, and then the building comes down, isn't it? One destroys something, to create something new. So to destroy for a good cause, for benevolence, is very much different from destruction out of anger, jealousy, hatred and ignorance. It is like atomic energy that is produced when an atom is destroyed. However, if the energy is not channelized or utilised properly, it can be very destructive. When it is channelized, it is used to bring electricity, light, and many comforts. It is the same with electricity, which as such is a destructive energy. Where high-power electricity is being generated, if you get come in contact with it, then you will be destroyed in no time. But, when electricity is used for a benevolent cause, through wires and transformers, it brings the energy down, and makes it available and useful for public. 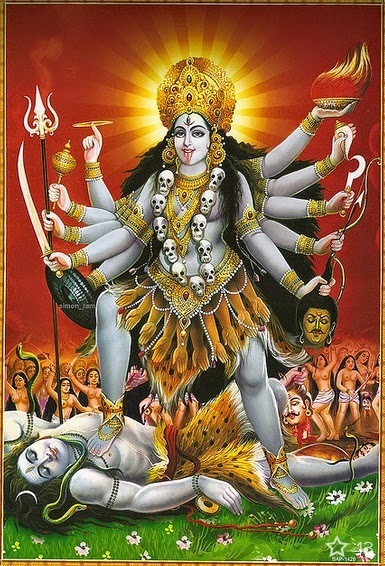 Similarly, Kali’s energy was the energy of destruction; when it opened up to destroy evil things, it was so powerful. So Shiva lay down to channelize it and make it benevolent, to protect the universe. Shiva always does that which is good for the whole world, the whole universe; he even drank poison. There is a mythological story. When the Devas (good forces) and Asuras (daemonic forces) were churning the Ocean of Milk, what came out first was poison. When the poison came up, it was Shiva who took it and drank it. As he drank the poison, his throat became blue. So, he is called Neelakanta; the beautiful one with the blue throat. That is how the story goes in Hindu mythology. Legend has it that after defeating Mahishasura and other demons, Goddess Kali was still outraged at the Adharma on earth. She continued destroying everything before her. All living beings were foreseeing eternal doom. To escape from the wrath of Goddess Kali they approached Shiva. To stop Goddess Kali from destroying the cosmos, Shiva went into the battlefield and lied down motionless among the corpses of demons. Goddess Kali moved across the corpses destroying and cutting them into pieces, suddenly she found herself standing on top of a beautiful male body. For a moment she stood still and then she looked down at the body and saw it was Shiva, her husband. When she realized she was touching her husband with her feet, Goddess Kali stretched out her tongue in shame and the destruction came to an end. Shiva then pacified the Goddess and danced with her. Together they started creation again and made the world free of Adharma.